Six Years ago, on 6th July itself India lost one of the Pioneers of Indian Business. We are talking about Mr. Dhirubhai Ambani. A dream that converted into the mission of his company, and thanks to this dream we now see international players now wanting to enter the Indian market. The Rs. 500 phone, which was a revolution in India’s Telecom History, was this man’s step to getting a phone in every Indian’s hands. The exploitative raj of players then was broken by Reliance by launching varied plans, which set up new benchmarks in India. Today, we see Reliance reaching out to every nook and corner of India and the dream being realised as we read this post. We Salute this man and his contibution to the market through his dream. We at Tele Gyaan are proud to announce an extension to our blog. The place is Tele Gyaan Forums and there you can post your suggestions, queries, complaints about your operators or anything that comes under this sun. Give yourself a heads up and register yourself pronto! We are waiting for you. With the number of readers adding up each week and the content increasing, we @ TeleGyaan thought that you needed a change. And here we are with a new look and some cool new stuff. We will have polls running through and also some cool new plans shaping up in the coming month. So watch out for this space and keep visiting. As a first initiative, we at our end would want to know your needs. Share your thoughts with us. But for the moment, enjoy the browsing experience and do not forget to participate in the poll “Rate Our Makeover”. Being connected to the Internet through your mobile phone is a great idea, especially when you are on the move or away from home. Operators have tried to pull in many users based on this proposition and have managed o succeed. What we did was a comparative study of the operators providing such service to users. Note: This study is done as per the rates applicable in Mumbai circle. This service comes for a flat fee of Rs.399 and provides 100 MB of free surfing. The operator offers a choice when it comes to choosing a service. Here are the choices. Orkut is a great place to find your friends and lost ones. But this Social Networking Site is becoming a hub for other things too. Take for instance a community, which sells cool numbers for amounts ranging from as low as Rs.300 to not so affordable amounts of Rs.8000. The numbers that are up for sale are quite interesting, some of which are 999 555 4433, 9895 880 880, etc. With about 150 plus members, people with good numbers are lining up to auction them off. So if you are one of those who want to flaunt mobile numbers, this is the place to be. Go grab your number. After Google launching the SMS based search service a few days back, it is Yahoo India who follows the same suit. The search results are retrieved in the form of SMS so anyone without a GPRS connection can also use the search service. A user has to send the query to 58242. Eg: “iPod” to 58242. Seeing the potential of SMS-based services, Google India has launched Google Search on SMS for mobile users who does not have an internet enabled phone. 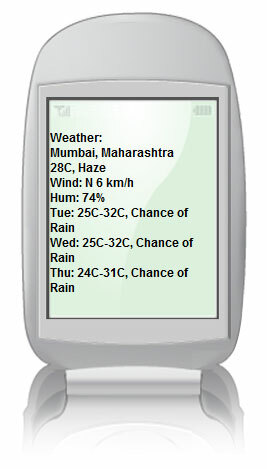 Users trying to search something must send their search queries (for instance, “weather Mumbai”) to 54664 (5GOOG). Not so good news for the users would be that searching on Google via SMS would cost you premium SMS charges. Currently, it is being offered by select operators – Aircel, Airtel, BPL, BSNL, Reliance. We have articles on plans, schemes, offers, promotions and what not. And we thought of having something new for our readers. This one is fresh and may prove to be of great help to you. It’s a concept called ICE or “In Case of Emergency”. I personally didn’t know about this concept until I received a mail from my colleague, with a subject that read “Important Information – Must forward”. And I must say it is one piece of information, which could save your life. Imagine a situation where one of us meets with an accident. If you are admitted to a hospital, the person who helped you get to the hospital or the doctor would want to contact your family, from your cellphone as it is the only thing available to them. In such a case people would have no time to check all your contacts. Thus to have easy recognition of family numbers on your cellphones, this concept comes to the rescue. The solution is simple and effective. What you can do is store the numbers of your family members or other numbers whom you want to contact during such a crisis by the name of ICE. Multiple numbers could be stored by using numbers after them for example: ICE1, ICE2, etc. This concept just needs to be passed on to people and thus lives could be saved by informing near and dear ones in time. So please do pass on the message, as anyone of us could happen to be in such a situation. Filed Under: Misc. Tagged With: Misc. You must have heard of less famous service provider known as Matrix. If yes, then here’s some more gyaan on it. There was a request made by one of our readers to review the Matrix International calling plan, and thats when I came across this scheme. The scheme is the best I came across. It would be the best for you too, if majority of your calls are to Hutch numbers.